A violin prodigy, Yorkshire, England’s Mik Kaminski joined ELO in 1973 after famously answering an advert in Melody Maker magazine. Ever since, Mik and his blue electric violin have dazzled rock audiences the world over. A consummate showman, Kaminski is the original violin wild man, shattering traditional notions of stage propriety with a classical instrument. If not for his talents on violin, Kaminski’s vocation may well have been humorist, as he is easily one of the funniest persons you’ll ever meet. You just have to sort through his Yorkshire accent to get to the jokes. LOU CLARK – Orchestral Keyboards (formerly of ELO and ELO Part 2) Originally a bassist, Bedford, England’s Lou Clark studied orchestration at Leeds College of Music and helped transform ELO’s sound with his string and choir arrangements on the band’s breakthrough album “Eldorado.” Today, when THE ORCHESTRA performs with symphonies, Clark dons his famous tuxedo and leads the world’s best national orchestras through the ELO catalogue of hits. Clark also created the Hooked On Classics series of albums that partnered well known classical pieces with modern drum beats. Clark is an unabashed Beatle Freak and a massive fan of English football. He also has kept notes on every show ever played by ELO Part II and THE ORCHESTRA. ERIC TROYER – Keyboards, Guitar and Vocals (formerly of ELO Part 2) Indiana, USA native Eric Troyer’s professional resume reads like a who’s who of rock history. His voice can be heard on mega hits such as “Woman” by John Lennon, “Uptown Girl” by Billy Joel, “Total Eclipse of the Heart” by Bonnie Tyler and on songs by Aerosmith, James Taylor, Meatloaf, Kiss, Lou Reed and many others. 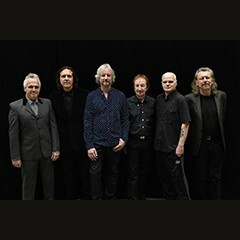 A founding member of ELO Part II, Troyer’s distinctive voice and keyboards–not to mention his tireless work ethic–have been a staple of the band for more than 20 years. Troyer has managed to survive years of exposure to the highest levels of rock and roll insanity with his good humor intact. He is a health nut and history buff. PARTHENON HUXLEY – Guitar and Vocals (formerly of ELO Part 2) Louisiana born Parthenon Huxley joined ELO Part II in 1998. Huxley wrote his first song at age ten. His records as a solo artist and band leader have earned three Album of the Year awards and a #1 single on Rolling Stone Magazine’s Exclusive Download chart. Huxley has also written four Top 20 hits with other artists, including Foreigner and E (Mark Everett). Much to his surprise, Huxley was named Costa Rica’s Rock Composer of the Year in 2010. A consummate rock guitarist, Huxley was tabbed to create two guitar loop libraries for Sony. “Hux” hopes to one day make use of his B.A. in Journalism and write a book about his experiences with THE ORCHESTRA. GORDON TOWNSEND – Drums (formerly of ELO Part 2) A native of Philadelphia, PA, Townsend began drumming professionally in his teens. He moved to Los Angeles in 1994 and formed P. Hux with Parthenon Huxley. After Huxley joined ELO Part II, Townsend was the first choice to replace ELO founding member Bev Bevan on drums. Townsend has been with THE ORCHESTRA since 2001, laying down an unshakable backbeat beneath the band’s often complex musical arrangements. A pro’s pro, Townsend steers his performance to the needs of the song, avoiding flash but supplying rock solid power and finesse. He is a sucker for cool musical gear and rescue dogs. GLEN BURTNIK – Bass and Vocals (formerly of Styx and ELO Part 2) Glen Burtnik’s extensive showbiz career includes a stint on Broadway as Paul McCartney in Beatlemania, a Billboard #2 smash hit “Sometimes Love Just Ain’t Enough”, ten years as frontman for rock legends Styx, and even several short runs as bassist for ELO Part II. Glen also released two solo albums for A&M Records. Burtnik is beloved in his home state of New Jersey for his over the top musical revues, most famously his Xmas Xtravaganza, which features dozens of notable performers. If Bruce Springsteen is the Boss, Glen Burtnik is surely the assistant manager.